The “OTL book” has just been extended with a chapter on synchronization (22 pages). Basic understanding of synchronization issues and critical section usage is required as this chapter only deals with OmniThreadLibrary-specific support for locking. Due to a strong language barrier we don’t hear from Turkish programmers much even though the programming (and Delphi) community in this big country is quite strong. That’s why I was pleasantly surprised when I received a proposal from that country to translate the OmniThreadLibrary book. We quickly set up a workflow (as the OTL book is still being written this is not a trivial task) and the book is now being translated. Although I didn’t see more than a few translated paragraphs yet, I have great hopes that the initial Turkish release will join the ever growing family of the OTL books (English, Russian, Spanish) early next year. Until then, you can express the interest in the book here. Great thanks go to Tugrul Helvaci for initiating the project and to Ramazan Gülbahar for translating the book! On Thursday, 29th I’ll be leading a workshop about LiveBindings and Visual LiveBindings in Ljubljana. The workshop will cover both XE2 and XE3 and will also cover differences between the VCL and FireMonkey implementation. Predavanje bo v slovenskem jeziku. Prijavite se tu. Last week I spoke at FireMonkey2 workshop in Ljubljana. Attendance was low (compared to other “Embarcadero Academy” sessions) but very attentive and interested in the FireMonkey development. Next session will be dedicated to LiveBinding (visual and nonvisual – both XE2 and XE3 will be covered) and is planned for 29. November. I’ll put a notice on my blog when a registration page is up. Christian has finished the housekeeping tasks (days ago but I was busy and forgot to put a notice on the blog, sorry), so the repository is stable again. this still might cause linking issues on Delphi 2007, if compiled for the first time, but I will investigate this in the next days. Next week we (Embarcadero + Marand + me) are starting the next cycle of Delphi workshops. This time I’ll be talking about FireMonkey2 – about everything that is new & great in the latest release of this framework. Predavanje bo – tako kot doslej – v slovenskem jeziku. Več podatkov dobite tu. Christian W. Budde has kindly offered to do a long-neglected housekeeping on the OmniThreadLibrary SVN tree. He now has committing rights and is already busy fixing .dproj files, SVN external references and other small things that I never have time to work upon. The current state of the SVN tree may be as of this moment described as a ‘slightly unstable’ so checkout/update at your own risk. I’ll let you know when the rearrangements will have finished. The ITDevCon 2012 is over and I’m back at home, resting and gathering impressions. The conference was even better organized than previous years and everything was running as smooth as possible (with the small exception of the projector in the main hall, which somehow was not capable of giving out a completely sharp picture). In addition to the multinational group of speakers, the visitors also came from variety of countries – I noticed four Germans, two Russians and a Lituanian – which plays well with the intentions of making the ITDevCon the biggest European conference. As usual, the conference took two full days, with five session timeslots on the first and six on the second day. At every time there were three parallel talks going on, some in Italian and some in English. I’ve given three presentations – general tutorial on regular expressions and two “hands-on” sessions in problem/solution format – one on Windows + OS X development and another on OmniThreadLibrary. Slides and sample code are available on my blog. I also listened to few sessions – both talks by Jeroen Pluimers were full of information and very useful; Ray Konopka’s session on user interfaces was incredible as always, Paweł Głowacki showed us what can be done with FireMonkey 3D components and Jørn E. Angeltveit gave interesting (WAT!) talk about the Smart Mobile Studio. I’m just too sory that I couldn’t follow Ray’s talk on creating custom controls for FireMonkey … Still, every session was recorded and participants will be able to get recordings of sessions they have missed. (By the way, recordings of last year conference are available on line.) I was also happy to finally meet Detlef Overbeek, the main guy behind the Blaise Pascal Magazine. A quick shout to people that I haven’t yet mentioned – it was great to talk to you! I would like to thank the organizer for inviting me again to the beautiful Verona and for all the great food we were able to taste in the two conference days (and at the pre-conference dinner). See you next year, guys! I am creating a Windows Service to handle report requests for our clients. Each client has multiple users who may run a report. I want to serialize the report requests for one client so that only one report will run for a client at a time (FIFO), but reports can run simultaneously for different clients. Since users can submit report requests anytime, I need to be able to append a new request to the end of an existing client FIFO queue without interrupting the execution of the current report. Or, if the client doesn't have a queue yet (e.g., it's the first report request), then I need to be able to add a client queue without disrupting any reports running for other clients. Once a client queue is empty, I want to destroy the client queue. I am new to OTL, but it looks like it will easily do what I need. I'm just not sure where to focus my attention. Is there a way to create named task groups that can execute the top task of each group simultaneously, where tasks can be appended to an existing group, and where groups can auto-terminate when the tasks are all executed? Perhaps there an example project or a similar post that I can look at to get started? I'm still somewhat of a novice when it comes to threads, so any advise is also welcome. Instead of running multiple tasks for one client, why don't you consider running one task per client and sending workload requests to that task? An example project is available in the OmniThreadLibrary repository in folder examples/report generator. This post describes the inner workings of that project. Apparently Delphi (at least XE2, didn’t test with others) allows you to write a comma-separated attribute list inside square brackets when annotating types and type members. IOW, following two code fragments are identical. I am not able to find if this is a documented behavior. Regular expressions - friend or foe? Regular expressions are one of the most underused features of the Delphi RTL. While in the past we could attribute this to the lack of built-in support, Delphi XE introduced the RegularExpressions unit which greatly simplifies the use of the regular expressions engine. This session will present basic ideas behind the regular expressions, examine the RegularExpressions unit and in particular the main workhorse - the TRegEx class - and continue with practical examples which will show how and when to use regular expressions - and particularly when to stay away from them. In the past few years, OmniThreadLibrary has become "de facto" standard for Delphi multithreaded programming. Still, the main stumbling block for programmers to "go multithreaded" is the grasp of patterns and practices for multithreaded development. This "hands on" session will take different practical examples, deconstruct them into basic operations and then show how to build simple parallel solutions based on the initial analysis. Multiplatform development is slowly taking hold in the Delphi world. While we can argue that the tools for the mobile platform are still in the infancy stage, the situation on the desktop is quite different. Delphi is a valid development tool for the OS X-based computers. The main topic of this session will be hassle-free multiplaftorm development - how to write your code that it "simply works" on both platforms and what to do when this is not possible. The OTL book is now available in Spanish language! Big thanks to jachguate who translated the book. A minor update of the “OmniThreadLibrary Book” has been released. Adapted to the OmniThreadLibrary 3.02 release. Documented background worker initializers and finalizers. Fixed minor problems found by [jachguate]. Update [2012-10-09]: Russian translation has also been updated. Update [2012-10-12]: Spanish translation has been released. I don’t believe many of you had opportunity to observe this error before. 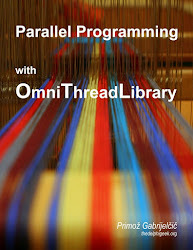 It’s official – Parallel Programming with OmniThreadLibrary is being translated into Spanish! The translator, Embarcadero MVP Juan Antonio Castillo Hernández a.k.a. jachguate, is already working on the book. I hope we’ll have first (partial) translation ready soon. Until then you can express the interest in the book on the LeanPub site. Just a quick notice – SVN HEAD works fine with XE3. I’m cleaning up some old issues and will be releasing new version over the weekend (most probably). Today I wanted to check whether the OmniThreadLibrary plays nice with XE3 (yes, I know, I’ve should have done this weeks ago, but there was simply not enough time) and I was completely surprised when OtlSync unit couldn’t be compiled due to an internal error G9413. One hour later I have reduced the problem to a simple test case (below) and to a simple fix. So the OmniThreadLibrary will be supported in the XE3 (as we all hoped for). For other poor souls that may have run into this problem, here’s a small test case and a workaround. The problem here is that the G9413 internal error is not reported on the line which causes the problem. The real culprit here is the ‘if Length(aMethCreate.GetParameters)’ call in the ‘TTest<T>.Test’ method. To fix the problem it is enough to introduce a temporary variable that stores the result of the GetParameters call. The problem is reported as QC #108942. 100+ people arrived. Presentation went through without big glitches and audience was very helpful when I managed to mess things up. Thanks, folks! Only four days are left until the XE3 event in Ljubljana! I’ll be showing all that is new in RAD Studio XE3 including (but not limited to) FireMonkey2, Visual LiveBindings, Windows 8 development and HTML5 Builder. Follow this link for registration and to see the detailed timetable. The always hard-working Alex has translated all the new material from the OTL book so now the Russian and English version are again in sync. Thanks for all the work, Alex! Good news for all OmniThreadLibrary fans – the long-awaited How-to chapter has been published. How to write 'blocking' multithreaded code with a mechanism similar to .NET's `async`/`await`. Redirecting output from a parallel for loop into a structure that doesn't support multithreaded access. Graphical user interface containing multiple frames where each frame is working as a frontend for a background task. Fixed image sizes and line breaks in the High-level Multithreading chapter. I will now spend few weeks finishing the Smart RTL chapter of the A Smart Book and then I’ll return to the Parallel Programming with OmniThreadLibrary. In the meantime you can express your interest in missing chapters in the poll on the right side of this blog. The Ljubljana stop of the XE3 World Tour will occur on September 18th. Register here (not yet linked from the World Tour page). This year I’ll be doing the presentation. I’m already looking forward to that! Let’s assume you’ve inherited this pretty useless code. Alex did the impossible and translated all existing parts of Parallel Programming with OmniThreadLibrary in a record time! The Russian version of the book is now on sale at LeanPub. Fellow programmer Егоров Александр (Alex Egorov) has offered to translate the OmniThreadLibrary book into Russian. As the original book, it will be published on the LeanPub. Current plan is to make it available after the High-level multithreading chapter is translated. At the moment, you can download the first draft which contains translated Introduction. You can express your interest in the book here. The Introduction to OmniThreadLibrary chapter is completed. New version of the book has already been published and all buyers have been notified by the email. The next chapter will be either Synchronisation or How-to. I’ll give you few more days of voting time to decide the matter. There’s a new poll available – look to the right and you’ll see it. If you have any preferences on what you want to read in the Parallel Programming with OmniThreadLibrary next, please vote. Today I have published new version of the A Smart Book. Newly added chapter Smart Control on 54 pages covers all built-in controls, from TW3Panel to TW3Header. Additional sections include tips on writing custom controls and description of the TW3ScrollControl control. A chapter on blocking collection (IOmniBlockingCollection) is now available online. A chapter on Parallel.ForkJoin is now available online. Pop quiz! What’s wrong with this code? A chapter on Parallel.Pipeline is now available online. Yes, there will be a book about the Smart Mobile Studio. I don’t know yet how it will be published – as a printed manual that you’ll get together with the software, as an on-demand printed book, as an e-book or combination of those options – but there definitely will be a book about Smart. For starters, you can download test chapter (not yet completely finished) about using regular expressions in Smart: PDF, Mobi, ePub (rename it to .epub after download). If you like what you see, you can express your interest in the book at the Leanpub site. On a slightly unrelated topic – I’m thinking about moving all my writing about Smart to another, yet unnamed blog. However, I’m of two minds about this so I would appreciate a feedback. What do you think – should I create a new blog or should I write about Smart here (after all, it uses almost the same language as the Delphi)? A chapter on Parallel.BackgroundWorker is now available online. Last time you’ve seen how to make different layouts for portrait and layout orientations. This time I’ll show you how to dynamically set layout parameters in Resize. A chapter on Parallel.ParallelTask is now available online. I spoke to Slovenian Delphi developers about multithreading today and you probably know that this is a topic I love to speak about. The room was packed (I took this photo five minutes before the beginning, more people arrived after that) but still listeners managed to stay attentive through the four-hour session (including a short break). Lots of interesting questions too – it is good to see many developers actively interested in multithreading. We’ll probably repeat this session in the autumn as again there was much more interest for the speech than this room can handle. Smart Mobile Studio was released today. To celebrate this – in my opinion – very important step for the Object Pascal language, I have prepared a series of articles on the Layout Manager – a feature of the Smart RTL that I wrote. Smart is an excellent tool, but in some areas it clearly shows that there was only so much time allowed for the development. I’m sure Lennart will polish the rough edges in next releases but for now we have to do with what we have. One of those rough edges is component placement. You can drop components on the designer and set their size but there’s no mechanism for dynamic size adjustments. In other words – there is no Align, no Anchors, no Margins and no layouts (as TFlowPanel and TGridPanel in Delphi). We have to resize components in code, in the overloaded Resize method. I quickly got sick of writing resizing code and decided to alleviate the problem by writing a layout manager. It does not work in the designer, you have to declare and use it in code, but still it is a big simplification over the default “just call SetBounds from Resize” approach. I donated layout manager to the Smart project and it is included in the 1.0 release as the w3layout unit. This article starts a short series which will explain layout manager on simple examples. All of those examples are also included with the Smart installations (look in Demos, LayoutManagerDemo). The Smart Mobile Studio is nearing its release date (no, can’t tell you when, but it will be soon, really soon) and it’s time to revisit my demos. You test them all from my website (just click on the images) and access the source code. If you don’t (yet) have Smart, you can browse OPP file with my primitive OPP Browser. Accelerometer-handling demo (iOS only). Move the square by tilting the device. Conway’s Game of Life. Works on desktop and on tablets. Click in the gray rectangle on the left to open a library of building blocks then drag and drop a block on the game surface. Gesture-handling demo (iOS only). Handles move, zoom and rotate. Mandelbrot explorer. Works on device (at least on iPad) and on desktop. Paint with multiple fingers (iOS only; single finger may work on Android). Also handles mouse on desktop. No IDE is mature until it has a TSmiley component. Supports desktop and mobile. Click/touch to change TSmiley’s mood. Incidentally, I’ll be in Germany just when the Delphi-Tage 2012 will be going on and I'll be staying fairly close (in Nürnberg). Is there any interest amongst my German readers in me presenting a session on multithreading there? This is an announcement for the next “Embarcadero Academy” session. This time I will be talking about my favourite topic – multithreading. As the previous two sessions (Unicode, FireMonkey), this one is intended for the Slovenian Delphi programmers. The rest of my post is directed to potential participants and is therefore written in the Slovenian language. How do you build FireMonkey iOS applications on Lion? Delphi uses FPC 2.6.0 to do the iOS compilation. I have Xcode 4.3.1 installed (no idea why the version is not displayed in the list). FPC 2.6.0 doesn’t recognize it. Apparently it only works with Xcode up to 4.2. Apple only offers XCode 4.3.1 for Lion. So I’m asking you – can I really use Lion to compile FireMonkey iOS applications? Doesn’t seem so. I have big problems with FireMonkey applications not running on my new Mac Mini. Does anybody have any information about any possible incompatibilities between XE 2 Update 4 and OS X 10.7.3? Full problem description is on StackOverflow. This problem is connected to the Thread Status window. If you have this window visible in the Debug desktop, Delphi will lock when you try to run an OS X application in the debugger. Removing Thread Status window from the Debug desktop solves the problem. Interestingly, some installations of XE2 Update 4 are working just fine even when Thread Status window is visible. This is an announcement for the second “Embarcadero Academy” session. As the previous one, it is intended for the Slovenian Delphi programmers. The rest of my post is directed to potential participants and is therefore written in the Slovenian language. The first “Embarcadero Academy” session was a huge success. More than 40 people were present (we had to cap the participants as the venue don’t allow for larger audience) and as far as I could tell from all the direct and indirect feedback they were very satisfied with the three-hour Unicode presentation. The topic of the next workshop will be FireMonkey. See you on March the 29th! In 2012, Embarcadero with the help of Slovenian distributor Marand is preparing a series of presentations, focused on different aspects of Delphi programming – Unicode, FireMonkey, multiplatform development, Object Pascal as a modern programming language, debugging, multithreading and more. Presentations will be given in Slovenian language by yours truly. The rest of my post is directed to potential participants and is therefore written in the Slovenian language. Pop quiz time! What would the user see if this code is executed in your application? The answer may surprise you: Nothing! At least if you’re not using the latest SVN version. Blaise Pascal Magazine #21 is out with with my introductory article on debugging. Two more advanced articles on the same topic are scheduled to follow. I wrote about handling accelerometer in iOS from the browser before (Detecting Device Movement, Accelerometer Demo) but I wasn’t happy enough with my code and I promised to return with the third part. Today I returned to the topic with advanced features – handling data smoothing and calibration. In the last week I’ve republished all the articles about multithreading I’ve written for the Blaise Pascal Magazine. To simplify linking from other sites, I’m listing them all in this post. This article was originally written for the Blaise Pascal Magazine and was published in Issue #18. Relevant Delphi code is available at http://17slon.com/blogs/gabr/BPM/HighLevel.zip. This article was originally written for the Blaise Pascal Magazine and was published in Issue #14. I have just finished a pretty long chapter on futures. Any comments, corrections, ideas etc are welcome. And by that I mean a fresh backup, made just now, not an idea that there may exist a person who knows where a backup is stored! Make sure you can restore from the backup! And by that I mean that you have tested the restore procedure. On the backup that you have just created. And that you have tried accessing restored backup with the program that usually operates on it! Don’t type any SQL commands. Use only scripts/programs that were previously tested on a development/test database. And by that I mean tested by yourself, not by a fictitious somebody who may have tested a script three years before on a database used by a completely different program! And by that I mean DON’T MODIFY PRODUCTION DATABASE! This article was originally written for the Blaise Pascal Magazine and was published in Issue #11. Relevant Delphi code is available at http://17slon.com/blogs/gabr/BPM/Synchronisation.zip. This article was originally written for the Blaise Pascal Magazine and was published in Issue #10. Relevant Delphi code is available at http://17slon.com/blogs/gabr/BPM/FourWaysToCreateAThread.zip. This article was originally written for the Blaise Pascal Magazine and was published in Issue #9. My accelerometer blog ended rather abruptly, without a demo program so today I’m returning to the topic. To test the accelerometer control I wrote a very simple program in which you can move a rectangle around the screen by tilting your iOS device. You can test it here. This program builds heavily upon the source code I found on Alberto Sarullo’s blog. Thanks! First small part of the forthcoming documentation is available in the wiki, Any comments, corrections, ideas etc are welcome. For my next quest I decided to find out how accelerometer works in web applications. IOW, I wanted to control an object on my HTML page just by moving my iPad around. Is there a Windows application that simplifies editing of Wiki-formatted documents? I would settle for a very basic one - all formatting can be displayed in wiki format on screen but I would like some helpful shortcuts and logic that would simplify multilevel list editing, basic formatting, cross-document linking etc. Do you have any recommendation? I'm sick of using Notepad2 for these purposes. That’s how it’s going to look. If you feel I have left something out, now is the time to raise your voice. No IDE is mature until it has a TSmiley component. This week I got a sudden urge to write TSmiley component for Smart Mobile Studio IDE. After all, what is a development environment without a smiley? My TSmiley is not an enterprise-y solution like latest Nick’s revisit of the old theme ;), oh no, it is a lean and mean component without any special bells and whistles. You can select the smiley’s emotion and it will change the look. And that’s it. I thought that a story about TSmiley for Smart would be instructive for you, dear reader, as this is almost the simplest component one can write. Read on to see how writing a component for Smart is very similar to writing a component for Delphi and how it is also utterly different. I mainly started playing with the Smart Mobile Studio because I wanted to write some stuff for my iPad. OK, there’s a small issue of possibly producing client applications for my job and maybe for some freeware/shareware stuff I’m thinking about, but this is not on the horizon yet. Therefore, iPad. (And I don’t have iPhone and I don’t care about writing stuff for my wife’s Android, so – iPad.) And writing for iPad means supporting touch gestures. Touch is natively supported in Smart. Gestures are not (but that may change before the release). What’s the difference, you ask? Touch subsystem will give you information about separate fingers like – finger has touched – another finger has touched – first finger was moved – both fingers were moved – while gesture subsystem will give you a simple – zoom gesture in progress. But hey, let’s start with touch. Lots and lots of stuff can be written with just the information about the fingers touching the screen. Today I’m revisiting example from November 2011. This time I’ll solve it using the new Parallel.BackgroundWorker abstraction. Part of the Zarko’s requirements (see the original post for full text) was a cancellation support. When I wrote OmniThreadLibrary in Practice –Background Worker and List Partitioning in November, I noticed that OmniThreadLibrary needed another high-level abstraction, a background worker. I published some ideas on how the background worker interface could look. Those ideas were later developed in a full-fledged high-level solution. After I finished my very first Smart program, I wanted to enhance it with some interactivity. I wanted the user to be able to navigate through the Mandelbrot set by using mouse and touch. For now, I have only implemented the mouse part, touch events will be handled later (soon, I hope). Click & drag with the left mouse button shows a rectangle on the screen. When the mouse button is released, program zooms in to display the selected rectangle. Double-clicking zooms in around the point of click. Right-clicking zooms out around the center of the image. Right-click & drag shows a line on the screen. When the mouse button is released, program moves the current view (point of first click is moved to the point of release). If a drag operation is in progress, user can click and release the other mouse button (left if right-drag is in progress, right if left-drag is in progress) to cancel the drag operation. You can see the navigation in action in this (very low quality, sorry) YouTube video. Last week I wrote about my first impressions about the OP4JS/Smart Mobile Studio project. This week I’ll show you my first program.